"The Atomic" or "Cold Pull" is a simple process that should be your first line of defence if you have started experiencing under extrusion or bad print quality in general. This can be caused by debris/carbonized plastic sitting in the nozzle which can happen if the nozzle has been sitting hot without extruding for a while. The method is named after the user MostlyAtomicBob who first introduced the method to the Ultimaker forums. The idea behind this method is to remove any dirt in the nozzle that might prevent proper extrusion. Select Material -> Change and wait for the machine to eject the filament. Then select Cancel instead of inserting new material. Move the print head to the front of the machine by manually moving it there. If you can't move the head, power cycle the machine to turn off the stepper motors. Moving the head to the front makes it easier to access but more importantly will protect the rods from bending as you'll be putting pressure on them. Move one or more of the black clips (A) out of the way. 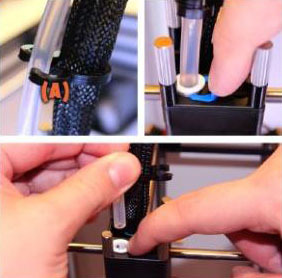 Either open them up or simply slide them along the bowden tube to give yourself enough room to work with. Remove the horseshoe (red or blue) underneath the white tube coupling collet. Press down on the collet so that it sits flush with the top of the print head and hold it there while gently pulling the bowden tube out of the print head. Cut off about 20cm of filament and straighten it out as much as possible to make it easier to insert. It can help to cut the end at a bit of an angle. It's also a good idea to move the print head to one of the corners. This is to help prevent you from bending the rods. If the motors are powered down you can easily move the head by hand, but if they are energized you will not be able to move them at all. In that case, simply power cycle the machine (turn it off and on again) and the motors will be released. 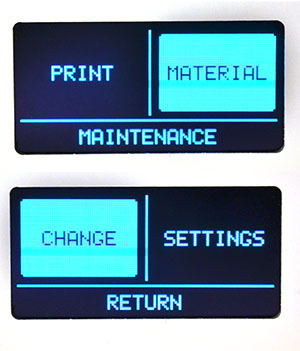 Select Maintenance -> Advanced -> Heatup nozzle and heat the nozzle to printing temperature by turning the menu button. If you have only printed with PLA you only need to heat up to ~220C. If you've printed using other types of filaments with higher melting temperatures you need to raise the temperature to ~250-260C to make sure any residue is fully melted (small fragments can remain even after you've printed with PLA for a while if you're unlucky). 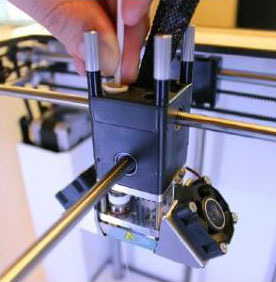 Once the nozzle has reached the set temperature push the segment of filament into the nozzle. Apply some pressure and you'll hopefully see some plastic coming out of the nozzle, keep pushing a bit to "flush" some filament through the nozzle. If no filament comes out don't panic. Lower the temperature to 85-90C (for PLA) or 160C (for ABS). While the print head is cooling down keep applying a little bit of pressure. The reason for this is that when the nozzle is very hot the plastic will dribble out and leave a void in the tip of the nozzle, by applying a bit of pressure you make sure that the nozzle is completely full until it has cooled down enough that the plastic no longer dribbles out (usually about 140C or so, it's not an exact science). Wait until the nozzle reaches the set temperature and then remove the filament with a quick pull. If you end up with a very elongated piece of plastic your temperature was too high and if it's stuck the temperature is too low. Check the colour and shape of the tip of the filament. 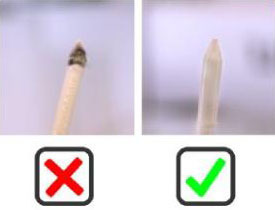 You want to get a "plug" at the end that is shaped like the interior of the nozzle and it should be clean. Repeat step 3 and 4 until the filament comes out without residue and with the correct shape. 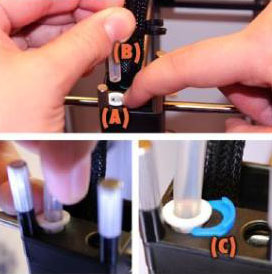 Push the white tube coupling collet (A) down so that it sits flush with the head of the printer and then insert the bowden tube (B) all the way down into the white PTFE isolator that sits on top of the nozzle. Sometimes the bowden tube can get stuck on the way down so you'll need to wiggle it around a bit. Make sure that the bowden tube is all the way down into the PTFE. Keep pressure on the bowden tube and then lift the white collet as high as it will go before putting the horseshoe back in place. It's important that you lift the white collet like this so that the bowden tube doesn't move up and down during retractions. If you pull and push gently on the bowden it shouldn't move. If it moves ever so slightly that's ok but ideally it shouldn't move at all. Now that you've read how to do the Atomic the traditional way here's an alternative method that you can do as well. We like to do this every time we change material. Instead of removing the bowden tube you can actually just push and pull filament at the feeder end. As long as the feeder motor is powered down (easily accomplished by power cycling the machine) it's not difficult to manually push filament into the hot end or pull it out. So what we do when changing filament is to heat the print head up to printing temperature. Then push filament manually until it starts coming out of the nozzle. Then lower the temperature and finally pull the filament out with a quick tug once the temperature reaches ~85-90C. When you now insert the new material you wont have to flush the old colour out, you'll get the new colour immediately and you will have cleaned the nozzle at the same time. You should snip off the cone shaped tip of the old filament as it will be slightly thicker and can be difficult to load properly.